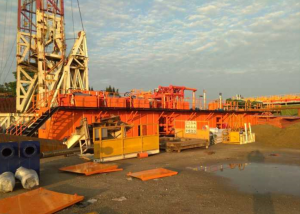 AIPU Solids Control delivery 3 sets solids control system to drilling site and we just finished the last set system drilling site commissioning end of last month. The whole system was tested on drill site one by one with water filled in tank. It is 3 tanks lay in a line and another 3 tanks lay beside #3 mud tank to make L type layout. There are shale shaker, vacuum degasser, decanter centrifuge, centrifugal pump and mud agitator installed on mud tank for mud recycling, mud storage and mud mixing applications. 1. 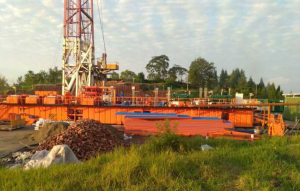 The whole system is working for oil drilling to match with China brand drill rig maximum drilling depth 7000 meters. 2. 3 sets mud pump lay beside suction mud tank with mud suction line arranged in all clean mud tank. 3. 3 sets linear motion shale shaker lay on shaker tank for mud treating capacity 1500GPM at 40 mesh screen. Mud cleaner with desander and desilter cyclone sit after shale shaker for second phase and third phase cleaning. The centrifuge sit after mud cleaner for forth phase cleaning for fine solids separation by centrifugal force. 4. Mixing pump and mixing hopper sit on mixing tank with all mud mixing suction line and discharge line to make mud mixing application. 5. All equipment and mud tanks make whole system a circulation system, drill hole – mud tank – drill hole circulation.